1Bring up the Create New Wiki dialog. 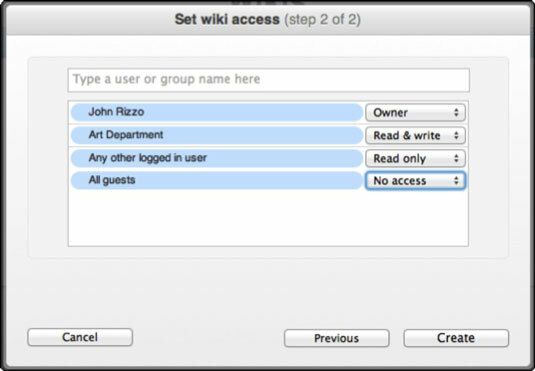 From the Server app, administrators can create a wiki from a Group’s page. Click Groups in the sidebar and double-click the name of a group in the list. Then click the Create Group Wiki button. 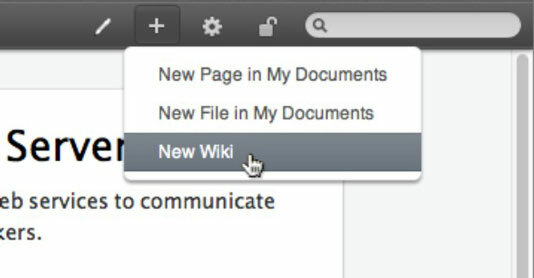 From one of the web pages of the built-in website, a user can click the Add (+) button in the upper right and choose New Wiki. 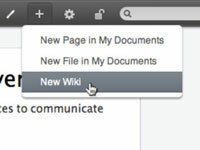 2In the Create a New Wiki dialog, type a name and description for the wiki and then click Next. 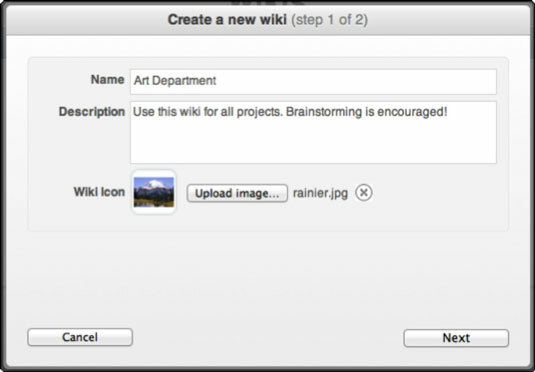 Optionally, before clicking Next, click the Upload Image button to add a photo or image to be the icon for the wiki. A 48-x-48-pixel image is optimal, but any image will work. 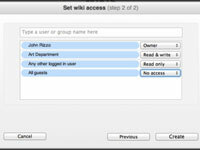 3In the Set Wiki Access dialog, choose an access permission for each type of user. 4To add another user or group, type a name in the empty field at the top, hit Return, and then choose a type of permission. 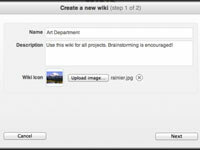 For example, you can add the Art Department and set permission to Read and Write. 5Click the Create button and then click the Go to Wiki button. The home page for the new wiki appears, in editing mode. 6Make changes by clicking the pencil icon in the toolbar. You can also create a new page for the wiki by choosing the Add (+) menu in the upper right and selecting New Page from the pop-up menu. Users who don’t have write permissions for the wiki won’t see this option in the menu.